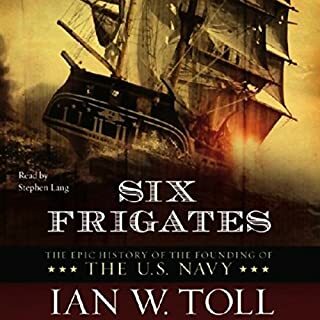 Six Frigates tells the story of the early years of the American Navy focused primarily on its first six "Heavy Frigates." We learn of the politics surrounding the debate over whether a navy was truely needed as well as its equiping and manning. Battles are described in exciting detail. We come to understand the important role the little American Navy played in strengthening the nation's role in international politics. I found the writing clear, never dull. And the narration was clear and engaging, never losing me in a monotone dialog but also never overdiong the exciting parts. Who would be interested in this book? If you have enjoyed the "Master and Commander" series for its historical and naval aspects, you will find this book a marvelous companion. If you enjoy colonial and american military history as much as I, then you will probably consider this a good addition to your collection. I hope you enjoy it as much as me.